Home ParentingRaising BoysBaby	Adjusting to life with two kids. Now with more adjusting! So Calvin is almost 1 year old. Weird huh? Some days I don’t even feel like I know him yet. I have this amazing relationship with Oscar now that he is 3.5. He can tell me what he wants and how he feels. He can tell jokes and say that he loves me. He is quirky and sweet and he knows just how to drive me up a wall. Calvin on the other hand is my sweet baby. He is the one that doesn’t really know what it means to be a little person yet and he is so mild-mannered that you could almost forget he is in the room. Except that I don’t want to forget. I want to know him and his little thoughts. I want him to know me. It’s hard to remember how I felt about Oscar when he was this age. Everything about every day was devoted to learning about him and entertaining him and teaching him. These days, my attention is divided. I don’t think I feel guilty about it, because this is how it has to be when one has more than one child. Not even Oscar gets that kind of attention anymore. And that is ok, albeit different. I just want to make sure I make the time to know Calvin like I know Oscar. And I think we are getting there. I have been making an effort to give each of my children lots of eye contact. I think something so simple can really make a difference in how our children perceive us as parents. I am a big believer in independent play and I often have Oscar go downstairs a few minutes before I get there. But when it is his time, I really make an effort to look him in the eye and answer his question or congratulate him on figuring something out. I try to play with Calvin and look him in the eyes when I tell him that Mama loves him. Because I can get busy and I can forget that these two amazing human beings are just here, watching my every move, trusting me to show them what love is. I say that I am making an effort because I have to make myself do it. So often it’s too easy to yell over my shoulder to wait a second or bark instructions because I am too “busy” to look up. Too busy. No way! 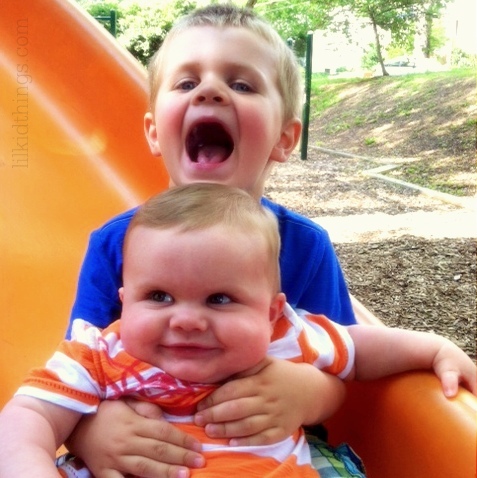 Adjusting to life with two kids is happening every day whether I like it or not. Some days are busier than others. In that, we pray that our boys will know that we value hard work and great moments of playtime. I want my boys to really know my eyes because they spent their childhood being treated to moments of my undivided attention. I want to know them. I can’t believe almost a whole year has gone by. In many ways, I have been in a fog trying to figure all of this out. Trying to be in the moment. Trying to forget other moments. But we are doing it. 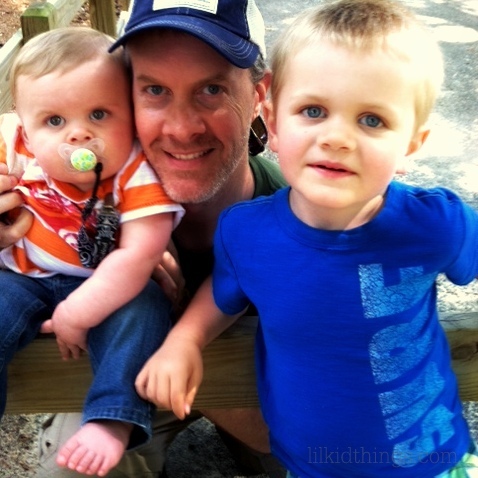 And I adore both of my boys and their daddy. This little family is the thing that keeps me going and the thing that stops me in my tracks. We are adjusting because honestly, what other choice do we have? We are not perfect. We are not a storybook, but our story is just that, ours. And I am beyond grateful to be a part of it. What a fun post. I love your point about making eye contact. I think that is SO important – especially for those of us who spend so much time online. When my kids come into my office to talk to me, I try to stop what I’m doing, turn and look them in the eye, and give them my full attention. They definitely appreciate it, especially as they get older. I totally get this post, and I only have one kidlet. It’s hard to remember to stop, look, and listen when our kids are constantly yammering for our attention, but even if they just stacked three blocks and they think it looks like the Biltmore Estate it’s important – to them. And that should make it important to us, as parents. So instead of an ‘Mmhmm’ or a ‘wait a sec!’ what kids really need is those few precious moments of undivided attention, eye contact, and enthusiasm for their words.. I love this post. It reminds me so much of days gone by. Just remember to pinch yourself sometimes and NOT live in the moment, because if you do one day you’ll wake up and those little boys will be teenagers! Scary but true! I find that even though we’re in a totally different phase of life (my baby is 6, and my oldest is 14!) what you said still applies. Seriously. You think they need you now, you think you are figuring it out-but I swear that is all of parenting right there in a nutshell no matter their age. Nice post. I have my second child coming in August, my 2 yo will be turning 3 in October. Seems like the same spread you have. I have worried and worried about this transition. I think you sound like you’ve got things down! I think it’s sad for us mothers thinking we can’t give the same attention and adoration to both kids as we did the first when we just had one (I’m due in a month with number 2. Number 1 is only fifteen months old.) But I think the thing to remember is, #2 has #1! There were SO many days I wished my oldest girl had a younger sibling to play with. Maybe #2 doesn’t get as much of YOU, but she’ll get that older sibling. I was the oldest and I NEVER thought, as long as I can remember, “Man, I wish I had more of my parents’ attention and less siblings.” My three younger siblings were my greatest blessings and best friends. Hi! I read your overwhelmed article on Baby Center, and it is right on. I´m from Mexico, where there is a strong family culture, and find it difficult when I get these feelings of it all becoming too much. I too have 2 boys, almost the same ages as yours (Emiliano is 3 and a half, Lucas is 10 months old), and really really want to get to know Lucas as well as Emiliano. It´s difficult with work, and everyday life. Anyways, I LOVE your blog, thanks for sharing. Hi Andrea! Would be really curious how this eventually turned out for you, now that you are in a few years distance. Hi! Thanks so much for your comment. You know, that’s a great question and I could probably write a book about my two guys! They are still pretty much night and day when it comes to personality. They have a lot in common too but they are 100% individuals. I love them equally and uniquely. I am still challenged almost daily because they are so different. I have to adjust the way I speak, my tone of voice, incentives, consequences, all of it to get the results we want from them. They are my pride and joy and truly my life’s work. I pray every day that they are growing into young men who will thrive into adulthood. Wishing you the best. Thanks for reading!